8 Gardening Ideas for Your Tampa Backyard! Make the most of spring this year with these 8 gardening ideas for your Tampa backyard! With the coming of Spring, most of us feel more drawn to the outdoors. Days are getting longer, temperatures are at their most pleasant, and everything begins to bloom and grow again. Start planning ahead now with these 8 ideas for making the most of your Tampa-area backyard. 1. Lay a firm foundation. Even the most beautiful and luxurious of gardens is incomplete without a place from which to enjoy it. 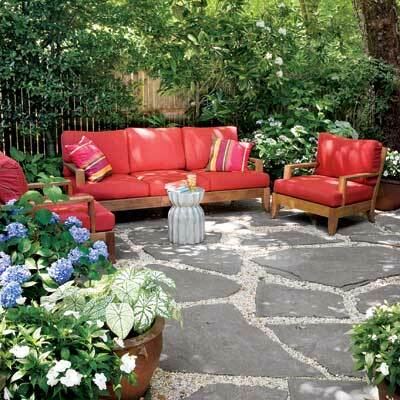 If seating areas and walkways seem to be lacking in your backyard, now is the perfect time to design and install them. From gravel to concrete, from natural stone to tile, hardscape options are available in a wide variety of price ranges and in styles to suit every taste. Central Florida’s balmy spring season is a great time to go lavish with the seasonal color. Milder warm temperatures and no more risk of frost, allows tons of flowering or otherwise showy plants to thrive, including begonias, verbena, salvia, dusty miller, cockscomb, moss rose, and zinnias! So go raid your local nursery and get creative with layers of color and texture. Then be sure to take time to enjoy the roses. Or phlox. Or Impatiens. You get the idea! Statistically, irrigation of lawns and gardens accounts for the largest use of Florida’s municipal water supplies. You can minimize your irrigation needs by taking such measures as installing a professional sprinkler system programmed to water only the amount of time necessary, and by running the system an hour before dawn to allow soil to absorb water before the sun rays cause it to evaporate. Also, consider hardscape options such as eco-pavers that allow water to quickly sink into the sub-soil, and apply a fresh layer of mulch in beds to minimize evaporation. Characterized by their thick, fleshy, drought-tolerant leaves and stems, succulents are perfectly suited to survive in our area. 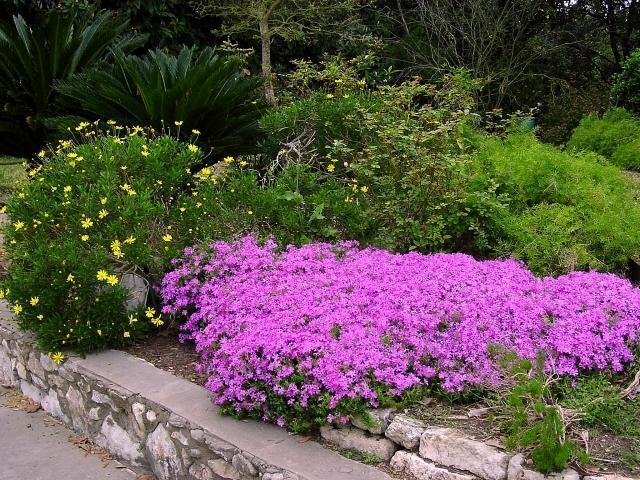 They thrive best when provided with excellent drainage, so potting them in a commercially available soil mix specifically designed for succulents and cacti works well. Requiring virtually no maintenance, succulents are the perfect way to bring big visual impact to even a small space. For an informative introduction to some of the most popular varieties, watch this video from the queen of all things green, Martha Stewart. To get the most outdoor enjoyment through the evening hours, consider investing in a landscape lighting system. Today’s landscape lights are available in a variety of styles for every application, and many even offer the compact brilliance and energy efficiency of long-life LED bulbs. Eliminate the risk of navigating pathways or stairs in the dark. Highlight specimen plants or architectural elements, and add ambiance to seating areas. You will be amazed how a few simple lights tucked discreetly throughout your yard can amp up the drama and sophistication of outdoor entertaining as well as contributing to the overall security of your home. One particular benefit of our Florida climate is the ability to grow a wide variety of things edible. Planting such things as mangos, avocados, bananas, and of course, citruses such as oranges and lemons is a great way to enjoy the “fruits” of your labor. Look to your local nursery for advice on which varietals to plant and how best to nurture them. Also, don’t forget about other easy-to-grow edibles such as tomatoes and herbs that can be grown in containers and used to grace your table nearly year round! Finally, make this the year that you explore some all natural options for fertilization. Chemically formulated commercial fertilizers, though capable of producing phenomenal results, can have an adverse effect on local wildlife such as bee populations, and through run-off have become a leading cause of toxicity in lakes and streams. Consider turning your own organic waste products like grass clippings and fruit and vegetable scraps into nutrient-rich compost that you can till into soil in planting beds and even spread throughout lawns. Pinterest is a treasure trove of inspiration for crafting your own backyard composters that require very little space like our favorite pictured about. For more information about composting, check out the awesome infographic here. We hope you have enjoyed these 8 gardening ideas for your Tampa backyard. For even more outdoor inspiration, click through our photo galleries of pools, spas and outdoor living and call us for your own in-home consultation!